UNLOCKED PROTRADER: Will these prices hold? The first week of Ixalan Standard is in the books, and we’ve got some cards that have taken a big leap financially. I want to look at a few of these cards, at the jump they have taken, and figure out if those prices are the price they will stay at. There’s a lot of factors to consider at a time like this, and some money to be made. I’ll make money either by selling now, buying now, or holding out. Heroic Intervention ($2-$5 this week): This is worth looking at because it’s a great Standard answer to Fumigate, as pointed out by our reader hargismb. It’s in enough sideboards to cause a decent spike, and $5 feels about right. That said, I’m not convinced. I can’t tell if it’s my own bias against this card, but it’s bad in a lot of situations where you’d hope it would be good. I don’t want to play this card, I’d rather have proactive ways to get cards back in Commander. I would be trading these away like mad at $5, especially since you likely didn’t get them at that price. Approach of the Second Sun ($0.75 – $3): Alternate win conditions are always going to have a certain appeal, and this one offers a certain inevitability. Counterspells or bust! The assorted Approach decks had a pretty good first week, and I don’t think this is done growing. I am in favor of trading for this card until it gets to $5 or so, and I think buying copies for a total price under $2 is a winner too, but only if you’re going to trade the card away. The margins eat you alive if you buy at $2 and sell at $5. It’s not worth it in that context. 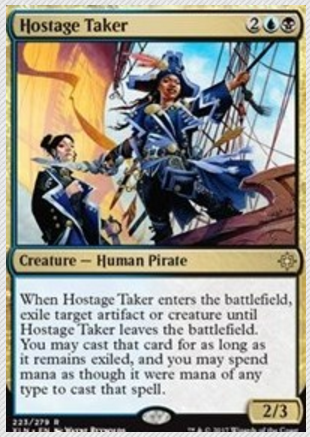 Hostage Taker ($5-$18): This was the card of the weekend, doing work in a variety of decks and it’s earned that praise. This pirate is an awesome creature, demanding an immediate answer before you get control of their creature. It plays very well with The Scarab God too! However, it’s a rare from the current set. It’s been a long time since such a card held a price at or above $10, so I’m telling you to let these go pronto. Get as much as you can as fast as you can, because hype or not, this price just can’t hold. I will be watching this closely, though, because when we aren’t opening Ixalan packs, this will be a prime contender for a jump back to $15-$20 in a few months. Fumigate ($0.50 – $4): Wrath effects have often ended up in the $5 range, and I don’t think this will be much different. It’s a year old, and I think this will be no different. I’m getting out of extra copies, and I’m putting some of my profits into a few sets of Dusk to Dawn, as Dusk appears to be the best pairing if Approach needs some extra removal. Bontu’s Last Reckoning and Yahenni’s Expertise are also good specs on this basis and won’t cost you much. 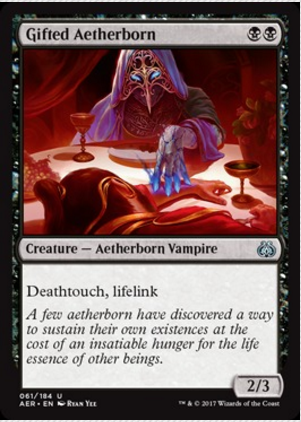 Gifted Aetherborn ($1-$2): There is a black-red aggro deck doing well online right now, and this is a four-of in that deck. I would be raiding my old draft boxes with gusto, because if I can buylist a stack of uncommons for $1 each (or more!) I’m all over that. You have to strike while the iron is hot, though. This deck won’t be popular forever, so you’ve got just a few weeks to sort your uncommons out and get them in the mail. Ebay auctions are closing near to $10 a playset, and that’s really tempting too, even with the fees. Deathgorge Scavenger ($1.50 – $6): The winning deck and the 3rd place deck each ran a playset of this Dinosaur, mainly for the ability to mess with Scarab God interactions. (Each deck also played a miser copy of that God, and bringing this back Eternalized must have felt great!) Again, it’s an in-print rare but the necessity of some graveyard hate appears to be the hot tech right now. Six bucks feels a touch high, I imagine this settles a dollar or two lower than that, unless the next sets give us more graveyard recursion. This has great potential as a spec if it drops to $1-$2 at rotation. Fetid Pools ($4 – $8): What makes the cycling duals great is the interaction with the checklands from Ixalan. Play the cycling land tapped, and all the checklands come into play untapped, so you can cycle the extras away. Value ensues. Fetid Pools was the biggest gainer, due to control decks, but Irrigated Farmland isn’t far behind and all of them should go up another dollar or two. I’m letting all of my spares go, and I’ll be picking these up at rotation for the long-term Commander value. The Scarab God ($25 – $40): If you’re going to play it in the next year, bite the bullet and grab your copies now. I suspect this is going to hit $50, as a small-set mythic which casual demand has made more scarce than most. 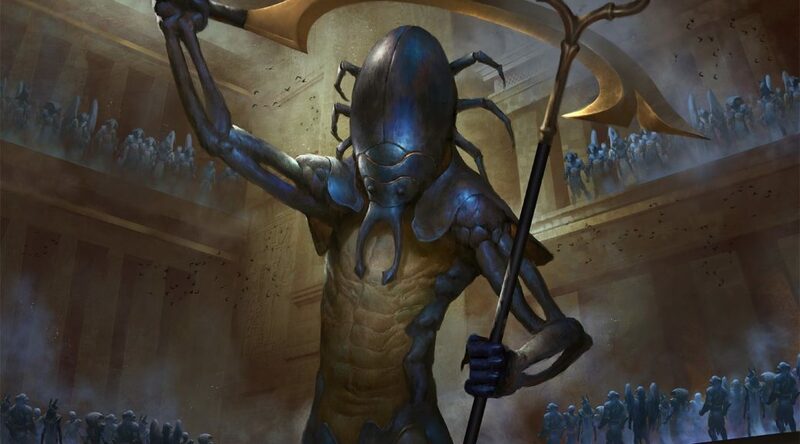 This God is awesome in Zombie decks and offers so much value in a Commander game, it’s no surprise that the combination of format demand results in a super-pricey card. I’d be surprised if this fell below $20 at rotation, too. Being on an Invocation isn’t helping the price much, the gameplay value is just ridiculous in casual games. Samut, the Tested ($2 – $5.50): Travis picked her a few weeks back at $2, and said that $10 was his target. It’s a two-of in a deck that finished 45th at the SCG event but has won some online leagues. I’m going to trust him on this, and tell you to hold this card a bit longer. My inclination is to take the double-up and get out, but if you got in at $2, then it’s all profit. Hold on a bit longer, as she needs a bit more publicity, camera time, and a publicized win. Then sell out with huge profit margins! You are right, and I had to dig deep to find it as a two-of in some sideboards. It’s not quite universal yet, but thanks for pointing this out! I’ve updated the article to give credit where it is due. Currently, I wouldn’t touch this with your money. I would advocate selling, and still do if you are able, but I think the time on that has passed already, even if one got in at a dollar, although at that entry point, buy listing is a way out. I can’t argue with the merit of the card versus Fumigate in standard, and I am sure some folks are buying the card based on that. What I will argue, is that all the standard crowd did was mop up, that the demand isn’t entirely due to standard. Competitive players, especially the more competitive, will have to pay what they have to pay to get the best playable cards. If you have ever read about the famous Roman general Pompey, you know that he got famous by arriving with his legions towards the end of battles, after the enemy had already been largely defeated. But because he was there when the final defeat took place, he reaped all the glory and the legions that did the real work, went largely unrecognized. That is what I am contending happened here. Hype off a couple side board cards isn’t going to drive such a spike on a card with such a massive available supply without significant help, which it had, by people who bought earlier for whatever reason. “Entirely” implies it’s not the 5th-most played Aether Revolt card on EDHREC, which it is. I think Standard has the juice to bump non-mythics from recent sets more than EDH, but to what extent does a 2-of inclusion in some sideboards pale in comparison to being in 5,000+ EDH decks? No word on the Fastlands? Many of them (Botanical Sanctum at least) have been growing in price in the past week. I personally think that the trend will continue until the Pro Tour? Thoughts? I’ll be honest, I simply overlooked them. If you have a set, keep them for playing with. If you have extras, I’d sell into the bump they are getting right now. I will be curious to see if they dip much at rotation, since they are all a factor in Modern deckbuilding, even though that format is fetch-and-shock dependent.